This made-to-order capital city is a lasting legacy of Akbar, one that he constructed in red sandstone and marble. This is also just as much a masterpiece of Mughal architecture as the world-renowned Taj Mahal. But, it is much more. True to Akbar’s philosophy as exemplified by his just and equal treatment of the Muslims and non-Muslims, the architecture of this city blended Hindu and Muslim styles competently. This is a rare phenomenon and one that sets it apart from all the other structures constructed by the Mughal Emperors. 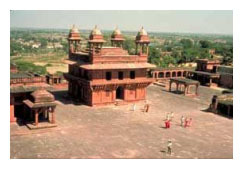 While the city was abandoned by Akbar as the seat of his Government, and it now exists only as a ghost city uninhabited by people, the structures that make up Fateh Pur Sikri nevertheless make a special trip worthwhile. No traveler to Agra and Taj Mahal should neglect a visit to this city! C: THE IMPERIAL HAREM: Jodh Bai’s Palace, Hawa Mahal, Viaduct, Birbal’s house, Stables Panch Mahal, Maryam’s House, Zenana garden, Nagina Masjid, Ladies’s Guest house, Harem Sara Guest House. D: OTHER MONUMENTS: Hathi Pol, Sangin Burj, Hiran Minar, Caravan Serai, Chahar Suq, Karkhanas, Rang Mahal, Samosa Mahal, Tansen’s Baradari, Todar Mal’s Baradari, Abdul Fazl House, Faidi House, Walls and Gateways, Mosque of Bahauddin, Mosque of Sheikh Ibrahim, Tombs of Sheikh Ibrahim and Sheikh Musa. 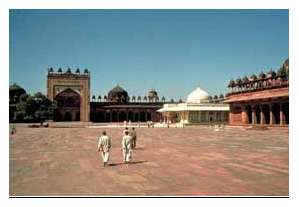 I will now take you on a tour around the most important or interesting structures in Fateh Pur Sikri. The descriptions are intentionally kept very brief. 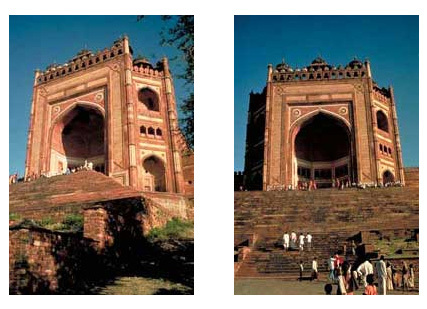 This impressive gateway was built by Akbar in commemoration of his victory over Deccan in 1601 AD. It stands almost 41 meters high, is placed on top of a platform of 14 meters and the whole structure is constructed at the highest point of the Sikri ridge. Thus strategically placed, it also faces south, towards the Deccan. The gateway opens to the main mosque, Jami Masjid. The Gateway was constructed of yellow buff sandstone and red sandstone. In cross section, it is roughly half of an octagon. The stylized arched openings, white and black marble inlays and decorative panels make for a dramatic entrance to the mosque. This, Eastern gateway is called The Royal Door, as Akbar used this on his way to congregational prayers. Smaller in dimensions, Badshahi Darwaja (19m x 13m), this gateway is no less artistic than Buland Darwaja. Similar yellow buff sandstone is fashioned to form six-pointed stars and double arched openings, one above the other and a hexagonal vestibule roofed by a segmented dome. The gateway itself projects in the interior, into the Jami Masjid. Buland Darwaja, the main entrance to the mosque leads one to a large courtyard. 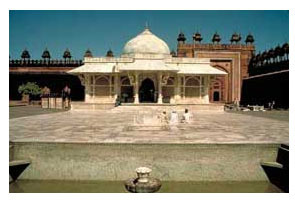 The Jami Masjid itself is adorned with several domes and mosaic of stone inlays and glazed tiles around the border. Painted designs and carved inscriptions decorate most of the surfaces of the walls and pillars. The main attraction in the courtyard leading to the Jami Masjid is this tomb. This exquisitely sculpted structure is made in white marble and surpasses all other marble mausoleums in India in grandeur and in finesse. Even more striking are the mother-of-pearl inlays of intricate patterns on ebony that adorn the walls of the grave. This is the building where disciples of Sheikh Salim Chishti congregated and prayed. This also served as the tomb for over 25 people including Sheikh Haji Hussain. The building is situated just east of the tomb of Sheik Salim Chishti and is made of red sand-stone. On all four sides of the building are perforated screens. A central dome and a verandah on all sides are some of the other features. Another unusual feature is a set of 36 small domed kiosks surrounding the central dome. 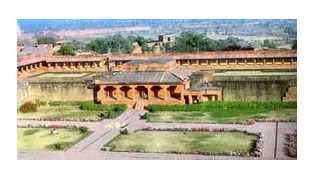 This is the building in which Akbar held private audience to dispense justice. It is spacious and is situated close to Agra Gate. This is one of the most interesting buildings in the Royal Complex. There is confusion as to the purpose of this building; some believe it was used by Akbar for private audiences with his ministers. Others believe it was used to store the Royal gems and jewels. The building was made of red sand stone; it had two storeys and sported four facades. These facades were themselves interesting; they have two stories themselves and balconies on the upper stories. 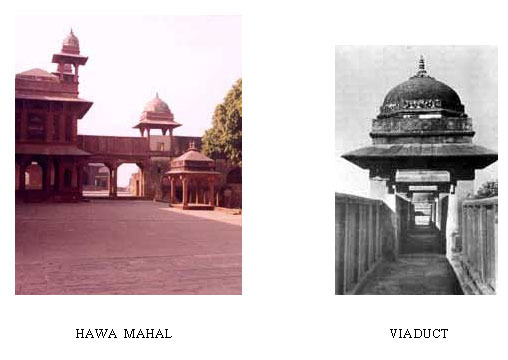 On each of the four corners of the building was a hexagonal kiosk, with a minor dome on top. Even more interesting features abound in the interior of Diwan-I-Khas. The spacious hall’s main attractions are the central octagonal pillar with a full head of brackets (36 in all), with exquisite pillars wih a full head of brackets (36 in all) with exquisite carvings that form “aquatic” brackets at the corners. A circular platform rests on top of the central pillar and corridors connecting this platform to the corner “quarter” platforms. The corridor is lined by intrinsically patterned fencing. These three structures are described together, as they are essentially one unit. 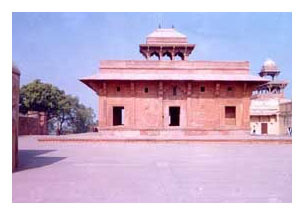 The Palace was named after the Emperor’s Hindu wife. However, there exists considerable confusion as to whether it was actually occupied by the queen. 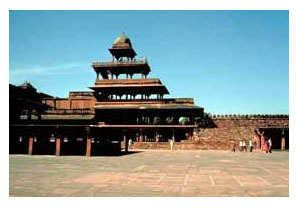 The structure is imposing, made of red sandstone, is two-storied and had large interior courtyards and open terraces. One special feature of the building and all the others that were part of the Imperial House was the provision of “purdahs (perforated walls) for the occupants. The viaduct leads from the upper storey of Jodh Bai’s Palace to Hawa Mahal. The viaduct also has “purdah” so that the women could go for outings. Hawa Mahal is a small building made in red sandstone and also has ample provision of “purdah”; this also serves to keep the inside temperature cool. 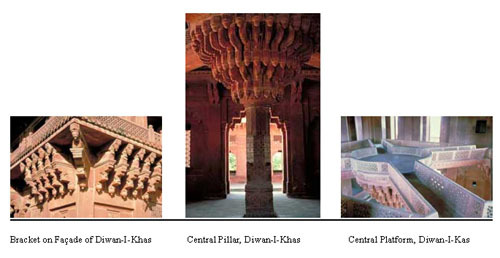 The overall design of the above structures demonstrates great fusion of Hindu and Islamic architecture. Carvings of Hindu themes such as Hamsas (swans), elephants, lotus etc., are additional examples of the grand theme. This small but elegant building was the official house of Akbar’s mother, Hamida Banu Begum. Built of red sandstone, the distinction of this building is that both on the outside and inside, lavish paintings in gold perfectly compliment the sandstone. Especially on the inside, the paintings again depict scenes of elephant fights, battle scenes, hunting etc. Also, the depiction of the Hindu Deity Rama and his aide Hanuman are particularly noteworthy. This five-storied structure is quite unique in that it was built entirely on pillars, without intervening walls. This style of building was inspired by Persian architecture and the sole purpose of the “wind tower” design was for keeping the whole structure aerated and cool. This “peerless pool” was a beautiful man-made pool in the “Royal Complex” of Fateh Pur Sikri. As shown in the accompanying figures, a central platform was connected to four corners of the pool by four causeways. Located near Anup Talao is this beautifully carved building. It bears the name of Turkish Sultana as it was occupied by two Turkish Queens, Sulima Sultan Begum and Ruqayya Begum. The figure also demonstrates ample evidence of the superior carvings and architecture that the Mughals are known for.